Looking like a princess is not that hard, but acting like a princess comes from the heart. Learn the ways of a true princess while you are dressed as Sofia! This Girls Sofia the First Classic Costume will turn you into a cute princess in training. Be on the lookout for your fairy friends, Flora, Fauna, & Merryweather! You've always treated her like a princess, so why not outfit her like one with this accessory kit? It's the perfect way to finish off a Sofia the First costume, and it will give her the regal style that she'll love. Start her out on a whole new adventure with this fun look! A princess has to be ready for anything! She never knows what kind of trouble she might get into while doing her basic duties as a princess. Amber might show up to try and ruin a ball or there might be an Enchanted Science Fair to participate in! This Sofia the First tin purse makes sure you can carry all the necessities you need, no matter what happens in the kingdom. Being a princess is not as easy as it looks, just ask Sofia. She was given the mystical Amulet of Avalor and it cursed her twice! One thing about being a princess is that it's important to look the part. 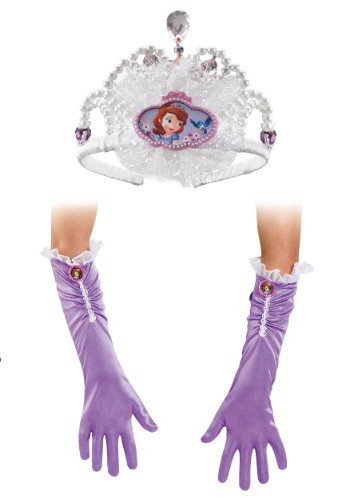 These Sofia the First Gloves will complete your costume and put enchanting touches on your final look! Teaching your girl how to be a princess can be quite the task, but did you know that there's a school for that? The Royal Preparatory Academy teaches new princesses all they need to know about royalty! Sofia the First has been training there ever since and we think your girl is ready for her princess training. This toddler sized dress recreates the look from the Disney original series, so your girl can be ready for princess school!